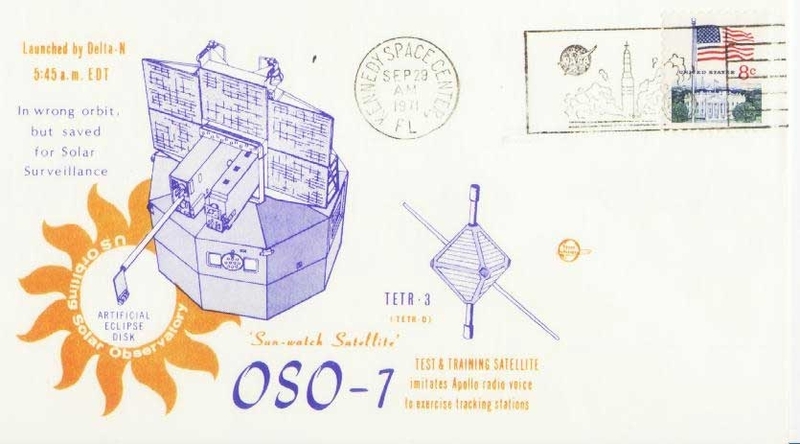 The OSO-7 satellite was launched on September 29, 1971 into a 93 minute, 33 degree inclination orbit. 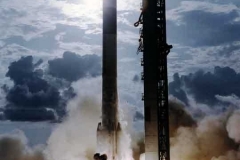 OSO-7 Launch SmDue to a failure in the control system of the second stage of the Delta launcher during a final short injection burn, the initial orbit, with apogee of 575 km and perigee of 330 km, differed from the planned circular 550 km orbit. This severely affected the radiation environment encountered by OSO-7 and the proton-induced detector background. 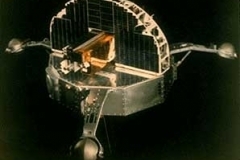 The satellite was controlled to keep the sun within 3 degrees of its equatorial plane for maximum solar power and to allow detailed studies to be made of the sun by the pointed instruments. 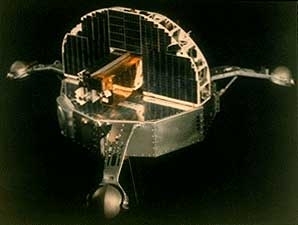 The mission went well for twenty months until the failure of the second spacecraft tape recorder on May, 18, 1973. 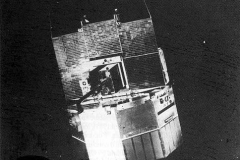 The spacecraft reentered the earth’s atmosphere and was destroyed in July of 1974. 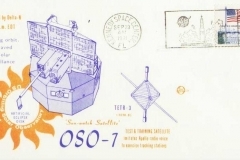 The sail of the OSO-7 spacecraft contained the solar array and the pointed solar instruments, and was stabilized to face the Sun. The wheel section below the sail rotated every 2 seconds to stabilize the platform and to cause the instruments in the wheel section to scan a great circle on the sky. 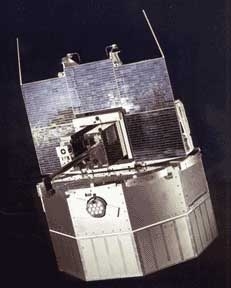 The UCSD OSO-7 Cosmic X-ray Experiment was one of six instruments carried on the OSO-7 satellite. 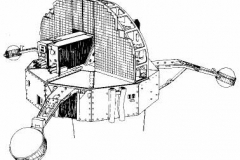 TheUCSD telescope was mounted in the rotating lower section of the spacecraft, pointing radially outwards to scan a great circle on the sky with every 2 second revolution. The low background, scintillation counter telescope was of the actively collimated type developed at UCSD. OSO-7 xRay smThe primary output of the instrument consisted of a series of energies and directions of individual x-ray counts, to a maximum of 3 counts/s. Events in excess of this rate were lost. A sun-sensing eye disabled the instrument whenever the viewing axis was within 11 degrees of the sun, since this was a cosmic source instrument, and not one to study the sun. The entire instrument was 51 cm long and about 30 cm in diameter. 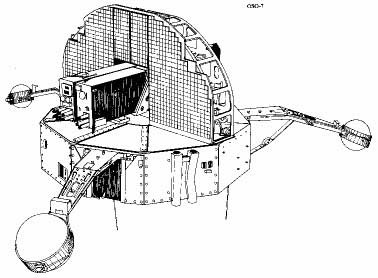 The UCSD OSO-7 Cosmic X-ray Experiment detector system consisted of the central detector and the shield, which had two parts: 1) the well and 2) the collimator. 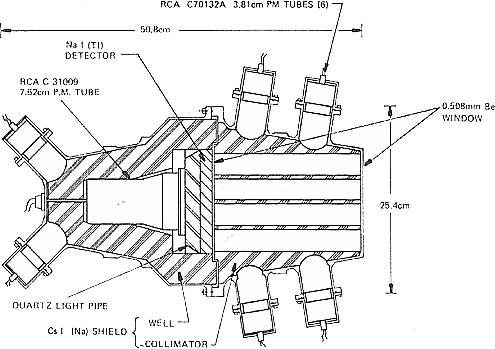 The central detector — a NaI(Tl) scintillation crystal — was surrounded by a large CsI(Na) shield counter equipped with collimating holes giving an aperture response of 6.54 degrees, Full Width at Half Maximum. The active anticoincidence feature of the shield suppressed background events that would otherwise have resulted from charged particles, and x-rays from radioactive decays in the instrument, striking the central detector. 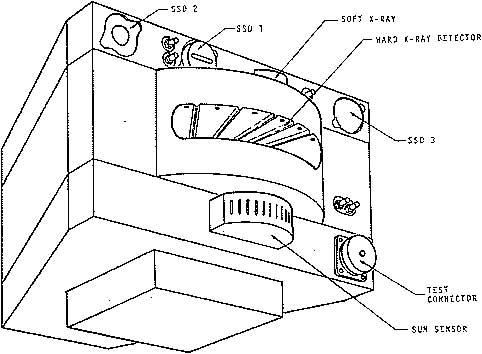 OSO-7 xRay Detector smThe central detector had 64 cm2 of effective area, was 1 cm thick, and was viewed through a 1.2 cm thick quartz lightguide by an RCA C31009 3″ photomultiplier tube. The central crystal entrance window was 0.5 mm thick beryllium, as was another window covering the top of the collimator section of the shield. The central detector was sensitive to x-rays in the 6–500 keV range. The shield counter had an average thickness of about 4 cm and a total surface area of 2440 cm2. 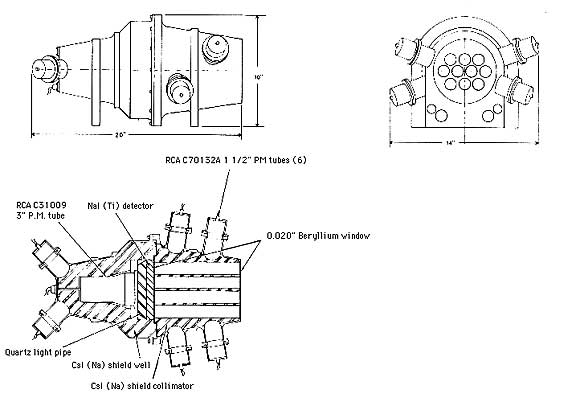 The shield crystals were viewed by six RCA C70132A 1.5″ photomultiplier tubes, whose outputs were summed. The effective energy range of the shield counter was about 50 keV to 1 MeV. A nominal cosmic x-ray event was one that passed through the holes in the collimator section of the shield and interacted within just the central detector. This would provide a signal from the central detector but none from the shield counter. Any signal from the central detector that was simultaneous with a signal from the shield counter was discarded as a possible non-x-ray event. The 7-bit PHA and 12-bit clock gave energy and time of arrival of each x-ray event to hit the central detector. The arrival direction of each event was calculated from the time and the spacecraft orientation data. The energy information was pseudo-logrithmically compressed into single channels of 4 keV width from 0–100 keV, double channels of 8 keV width from 100–200 keV and quintuple channels of 20 keV width from 200–500 keV. Besides the sequence of x-ray events, the electronics sub-commutated counting rates and housekeeping information. The central detector and shield counter rates were also output every 15.36 s. Finally, the central detector and shield counter upper and lower threshold rates were sampled each for about 1/4 of the 15.36 s time intervals. From these rates one could determine the overall performance of the instrument and could properly normalize the intensity of fluxes from x-ray sources, since the telemetry limits did not permit full information on all events to be preserved. Five commands gave control over the instrument. The central detector high voltage could be stepped to any of eight levels or reset to the first level. The signal used to determine aspect could be selected in three ways: solar eye during orbit day and gyro during orbit night; solar eye during the day and magnetometer during the night; or gyro for both. Finally, the shield counter high voltage could be stepped once and was reset by the aspect mode reset. Although the interaction of a high energy photon with a scintillation counter telescope can be extremely complex, this detector has simple response in the 10-100 keV range, where galactic emission is strong. The detector is directly sensitive to the passage of ionizing particles, which photons produce either by photoelectric ejection of atomic electrons, by Compton scattering, or by pair production once beyond the 1.022 MeV threshold. Photoelectric interactions usually result in the deposit of all the energy of the photon in the crystal, a few percent being converted into the light viewed by the photomultiplier tube. The main complication is the possibility (<25% chance in a thick detector) that accompanying atomic x-rays may escape from the crystal, which would reduce the energy deposit detected by the energy of the corresponding atomic transition. In practice, only iodine K x-rays have a significant chance of escaping from the central detector, thus producing an inferred energy 28.5 keV less than that of the original photon. The scattered photon resulting from a Compton interaction can have high energy, however, and may escape the central crystal. If this occurs, the pulse height in the detector will range from zero (for forward scattering) to 2E2/(m+2E) for a backscattered event, where E is the incident photon energy and m=511 keV. An important feature of the active anticoincidence design is that most Compton scattered photons interact in the shield counter and are vetoed. Calculations of exact escape probabilities are very complicated, and Monte Carlo programs are used to model instrument response to arbitrary precision. OSO-7 Response smThe response of the detector may be most completely described by the detector response function G(E’,E), defined so that if a beam of No photons of energy E is incident, the number of expected counts between E’ and E’+dE would be NoG(E’,E)dE. If G is expressed in terms of finite energy channels (i.e., the PHA channels), the result is the detector matrix Gij, a form particularly useful for computer calculations. OSO-7 Resolution smIn practice the energy measured by the PHA will not be the same as the energy deposited. The major source of variation is usually due to statistical fluctuations in the number of photoelectrons produced at the photocathode of the photomultiplier tube. The variance due to this process is proportional to the energy of the event. Non-uniform light collection from across the width of the detector is another source. An event near the edge of the crystal will produce a pulse height 30% smaller than one in the center. 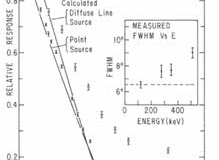 The ability to infer the energy of the incident photon as a function of energy is the energy resolution and is characterized as delta E/E (FWHM). 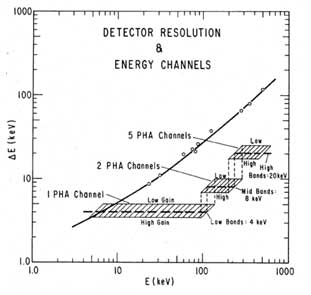 OSO-7 Gain smThe connection between the PHA channel measured and the incident energy deposited in the central detector is generally a linear function with offset and gain as the parameters. 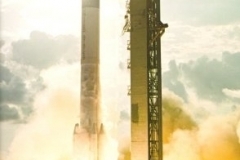 These values are determined from fitting x-ray line energies from known radioactive sources, such as Fe-55, Cd-109, Co-57, Hg-203, and Na-22, before launch. Once in orbit, variations in the gain and offset, if any, are inferred from measurements of spectral features in background spectra. The gain varied from 5 keV/channel early to 3.7 keV/channel near the end of the mission. The offset remained constant at 2.68 channels. OSO-7 Aperture smBelow 200 keV the CsI shield was very effective in stopping non-aperture photons, so the telescope’s directional properties were determined by the collimator. The response as a function of angle to point and diffuse line sources was estimated by a geometrical calculation. It was compared to laboratory measurements with various sources at a distance of 10 meters. 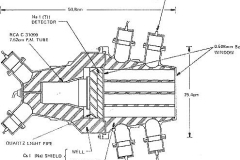 The tail of the distribution at large angles for the 22Na 511 keV radiation is partly due to Compton scattering in the air between the source and the detector, as well as leakage through the collimator walls. 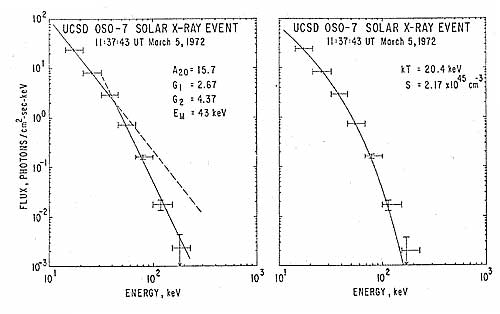 The UCSD OSO-7 Solar X-ray Experiment was designed to detect x-rays from the sun in the energy range 1.9 to 342 keV, electrons in the range 0.1 to 75 keV, and 2.6-54 MeV protons. The instrument was mounted in the wheel section which rotated at 30 RPM. 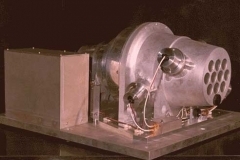 The Solar X-ray Experiment detector complement consisted of a soft x-ray detector, a hard x-ray detector, three particle detectors, and a sun sensor. The x-ray detectors and the sun sensor had 90 degree x 20 degree fields of view in the scan and pitch planes, respectively, while the two particle detectors which viewed a full hemisphere. Data were accumulated for ~10.24 s and consist of four or five 0.5 s whole-sun scans. 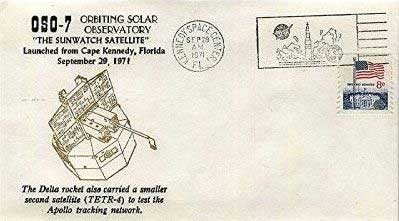 The sun sensor controlled the solar data acquisition and separate live-time counters kept track of the actual active data collecting time of each detector. The 2.54 cm diameter soft x-ray proportional counter contains one atmosphere of Xe/CO2 and has a 115 mg/cm2 beryllium entrance window. 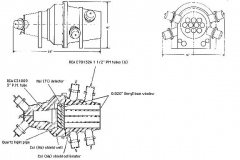 An aluminum collimator defined the field of view and reduced the effective area to 0.32 cm2. The output pulses were pulse height analyzed into seven linear channels of ~1.5 keV width, plus one channel covering 10-14.6 keV. The detector gain was monitored with the 5.9 keV x-rays associated with an 55Fe source in the aperture, and the gain could be adjusted by altering the detector high voltage by command. The quiet sun counting rate dominated the calibration source rate, so calibration data was taken during satellite night. The hard x-ray scintillation counter consisted of a 1 cm thick NaI(Tl) crystal with an area of 9.57 cm2 and a 41 mg.cm2 Al entrance window. An active anticoincidence shield of CsI(Na) narrowed the field of view and substantially reduced the background. The central detector’s output was pulse height analyzed into 9 logrithmically spaced channels with nominal edges of 11.2, 14.3, 21.2, 32.0, 46.2, 68.2, 99.7, 154, 229, and 342 keV. An 241Am source located between the central detector and the shield produced simultaneous alpha particles and 59.5 keV x-rays, which were used to monitor the conversion gain. The central detector had 15 gain steps of ~7% each by adjusting the photomultiplier tube high voltage. The hard x-ray detector can also respond to incident charged particles, particularly electrons with energy 200-600 keV, in a manner which mimics the response to photons. To guard against this false signal, the output of a solid state silicon surface barrier charged particle detector (SSD1), sensitive to electrons >100 keV and protons in the 2.6-13.5 keV range, was used to flag NaI(Tl) detector data that might be contaminated. 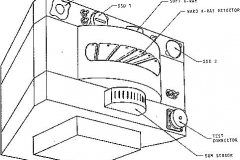 The SSD1 field of view was restricted by an aluminum collimator-absorber to match that of the central detector. 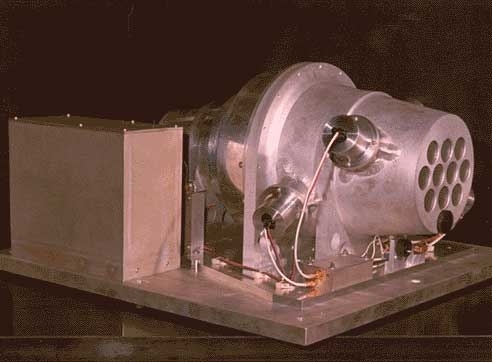 Three solid state particle monitors were located on the UCSD Solar X-ray Experiment. Each solid state detector had its thickness and cover material selected in such a way as to give a differential proton channel and an integral electron channel. 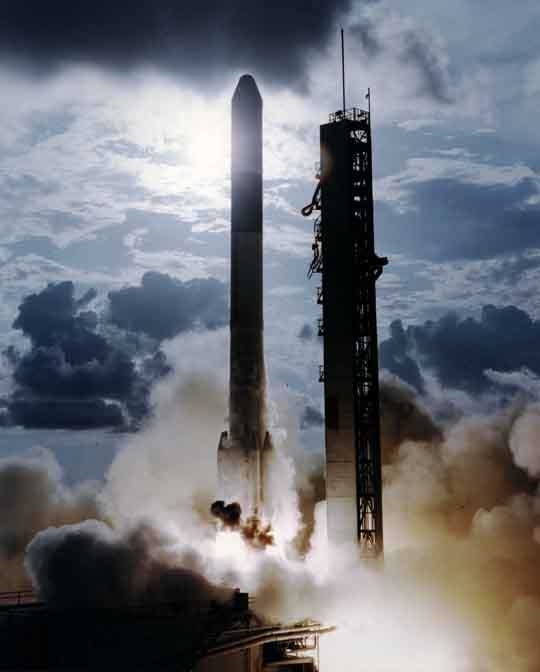 Although the highest energy detector failed two weeks after launch, the others provided useful information on particle fluxes in orbit. The solid state particle counters were were sensitive to electrons in the range 0.1 to 75 MeV and to protons in the range 2.6 to 54 MeV. The flux histories of the solar fluence were produced in two energy bands on a daily basis. The soft x-ray band of 5.1-6.6 and the hard x-ray band of 21-32 keV were used to produce the 1-minute rates that were searched for evidence of solar flares. The gradual phase soft x-ray component was generally clearly separated form the hard x-ray impulsive phase of flares in such plots. Each flare time history was then re-plotted with 10.24 s resolution. The solar flare of March 5, 1972 was classified as an N subflare located at S07 E40, and is shown to the left. The pulse height counting rates have been converted to fluxes using approximate conversion factors. These factors take into account photon detection efficiency, energy resolution, iodine k-escape probability, and the channel to energy conversions. A constant background before and after each flare was also assumed, and these regions for the March 5, 1972 flare are indicated in the plot. The spectrum of this event can be interpreted in two ways: 1) a broken power law that has one index (-2.67) up to a break energy (43 keV) and a second index (-4.37) beyond that, or 2) an exponential with a characterstic temperature (20.4 keV) and emission measure (2.17×1045 cm-3). The error bars shown are the estimated statistical errors in the actual pulse height channel counts converted via the detector model into equivalent flux. The statistical errors of the first four channels are too small to be shown. Ulmer, M.P., Baity, W.A., Wheaton, W.A., & Peterson, L.E. 1972, “Hard X-Ray Observations of Her X-1 by OSO-7”, Ap. J. (Letters), 178, L61. Ulmer, M.P., Baity, W.A., Wheaton, W.A., & Peterson, L.E. 1972, “Observations of Vela XR-1 by the UCSD X-Ray Telescope on OSO-7”, Ap. J. (Letters), 178, L121. McKenzie, D., Datlowe, D.W. , & Peterson, L.E. 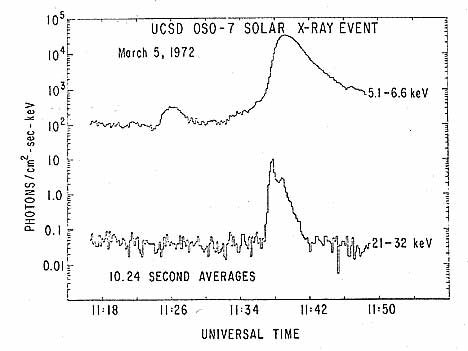 1973, “Spectral Development of a Solar X-Ray Burst Observed by OSO-7”, Solar Physics, 28, 175. Ulmer, M.P., Baity, W.A., Wheaton, W.A., & Peterson, L.E. 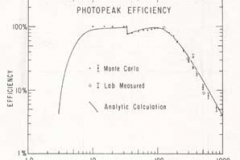 1973, “The Spectrum and Variability of Hercules X-1 Observed by the OSO-7”, Ap. J. (Letters), 181, L33. Ulmer, M.P., Baity, W.A., Wheaton, W.A., & Peterson, L.E. 1973, “Observations of the Binary X-Ray Source SMC X-1 from OSO-7”, Nature Phys. Sci., 242, 121. Ulmer, M.P., Baity, W.A., Wheaton, W.A., & Peterson, L.E. 1973, “Limits to the Spectra of the Perseus and Coma Clusters Above 7 keV from the OSO-7”, Ap. J., 183, 15. Ulmer, M.P., Baity, W.A., Wheaton, W.A., & Peterson, L.E. 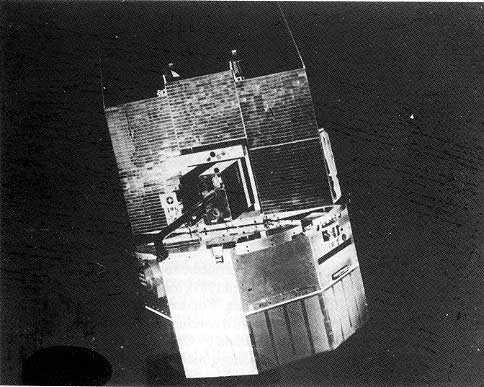 1973, “New Transient Source Cep X-4 Observed by OSO-7”, Ap. J. (Letters), 184, L117. Ulmer, M.P., Baity, W.A., Wheaton, W.A., & Peterson, L.E. 1973, “Observations of Cyg X-1 and Cyg X-3 Above 7 keV from OSO-7”, Nature Phys. Sci., 245, 90. Wheaton, W.A., Ulmer, M.P., Baity, W.A., Datlowe, D.W., Elcan, M.E., Peterson, L.E., Klebesadel, R.W. Strong, I.B., Cline, T.C., & Desai, U.D. 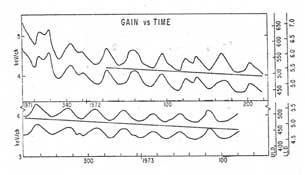 1973, “The Direction and Spectral Stability of a Cosmic Gamma-Ray Burst”, Ap. J. (Letters), 185, L57. Ulmer, M.P., Sammuli, A., Baity, W.A., Wheaton, W.A., & Peterson, L.E. 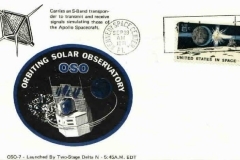 1974, “Long Term X-Ray Observations of Cyg X-2 from OSO-7”, Ap. J., 189, 339. Baity, W.A., Ulmer, M.P., Wheaton, W.A., & Peterson, L.E. 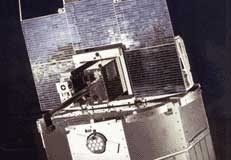 1974, “Extended Observations of >7 keV X-Rays from Cen X-3 by the OSO-7 Satellite”, Ap. J., 187, 341. Datlowe, D.W., Hudson, H.S., & Peterson, L.E. 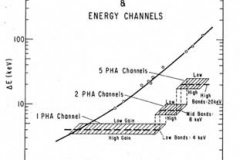 1974, “Observations of Solar X-ray Bursts in the Energy Range 5-15 keV”, Solar Phys., 35, 193. Ulmer, M.P., Baity, W.A., Wheaton, W.A., & Peterson, L.E. 1974, “Upper Limit to the X-Ray Flux from the Supernova in NGC 5253 above 7 keV from the OSO-7”, Ap. J., 193, 535. Datlowe, D.W., Elcan, M., & Hudson, H.S. 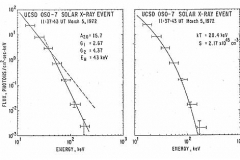 1974, “OSO-7 Observations of Solar X-Rays in the Energy Range 10-100 keV”, Solar Phys., 39, 155. Datlowe, D.W. & Hudson, H.S. 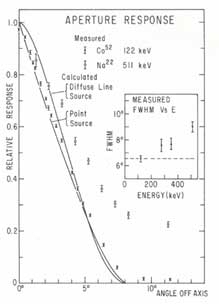 1974, “The Relationship Between Hard and Soft X-Ray Bursts Observed by OSO-7”, IAU Symp., 68, ??. Ulmer, M.P., Baity, W.A., Wheaton, W.A., & Peterson, L.E. 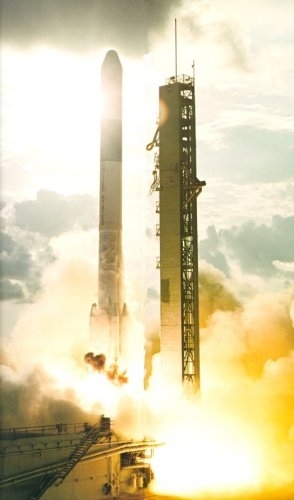 1974, “4.8 Second Pulsed X-rays from Centarus X-3 at Energy Greater than7 keV”, Ap. J., 191, 593. Ulmer, M.P., Baity, W.A., Wheaton, W.A., & Peterson, L.E. 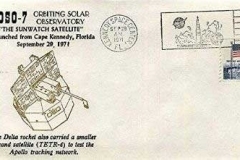 1974, “Observations of the 4.8 Hour Variations of Cyg X-3 above 7 keV from the OSO-7”, Ap. J., 192, 691. R.O. & Datlowe, D.W. 1975, “X-Ray Bursts from Solar Flares Behind the Limb”, Solar Phys., 40, 166. Baity, W.A., Jones, T.W.,Wheaton, W.A. & Peterson, L.E., 1975, “Hard X-Ray Observation of NGC 4151”, Ap. J. (Letters), 199, L5. Baity, W.A., Ulmer, M.P., & Peterson, L.E. 1975, “Observations of the Circinus X-1 Region”, Ap. J., 198, 447. Mushotzky, R.F., Baity, W.A., Wheaton, W.A., & Peterson, L.E. 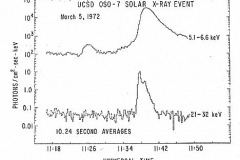 1976, “UCSD OSO-7 Observations of the Hard X-Ray Spectrum & Variability of Cen A”, Ap. J. (Letters), 206, L45. 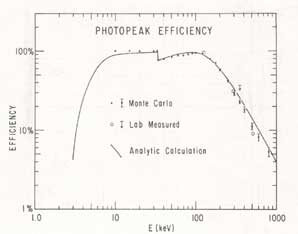 Datlowe, D.W., O’Dell, S., Peterson, L.E., & Elcan, M. 1977, “An Upper Limit to the Anisotropy of Solar Hard X-Ray Emission”, Ap. J., 212, 561. Mushotzky, R.F., Baity, W.A., & Peterson, L.E. 1977, “A Search for Hard X-Rays from Five Strong Extragalactic Radio Sources”, Ap. J., 212, 22. Mushotzky, R.F. 1977, “Observational Consequences of Synchrotron Self-Compton Models of Compact Extragalactic X-Ray Sources”, Nature, 265, 225. Mushotzky, R.F., Roberts, ? ?, Baity, W.A., & Peterson, L.E. 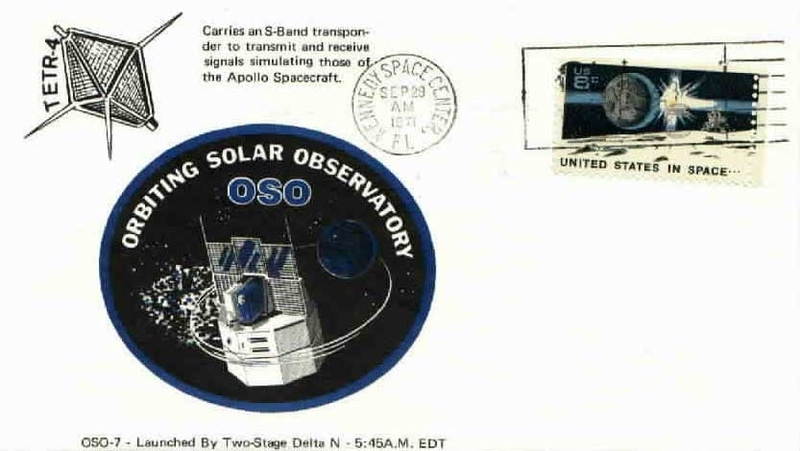 1977, “OSO-7 Hard X-Ray Observations of 3U0352+30 – X Perseus”, Ap. J. (Letters), 211, L129. 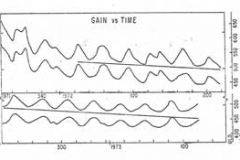 Elcan, M.J. 1978, “Observations of the Hard X-Ray Spectrum of the Impulsive Phase of Solar Flares”, Ap. J. (Letters), 226, L99. Rothschild, R.E., & Wheaton, W.A. 1981, “Non-Thermal Hard X-ray Emission from the Nucleus of NGC 1275”, Ap. J. (Letters), 243, L9.